The Cool Machine is designed to be fixed easily with minor mechanical skills. This ease will help you, as a contractor, minimize equipment down-time in the field. Also, there is hardly ever a need for you to send your equipment away to a service center. This article describes the typical maintenance scenario of our machines. Always use the right gauge of electrical cord to power your machine. It is tempting to use 100’ long standard extension cords to power the machine. While they will provide enough power to make the machine work, these extension cords build up heat and electrical resistance. Over time, this heat WILL damage the electrical components of your blowers and agitators. We recommend a 12 gauge wire to power the machine. Take great caution when you shovel material back into the machine. Material spills are notorious for hiding utility knives, nails and other foreign object which can damage the airlock seals. Be careful that the material you place into the machine is free of these objects. Consider using a lanyard for utility knives. I have yet to meet an insulator who has not lost a utility knife into the hopper. These can damage the airlock seals. Use a piece of string to prevent your loader from losing his knife in the hopper. We highly recommend emptying your machine of all material on a daily basis. Yet, we understand the reality of normal working conditions. We have protected the steel components with a powder-coated finish to prevent corrosion. Damp materials, left in the machine, over time, can degrade the lifespan of your machine. We recommend, before storing the machine after each day’s work, to clean out the material. 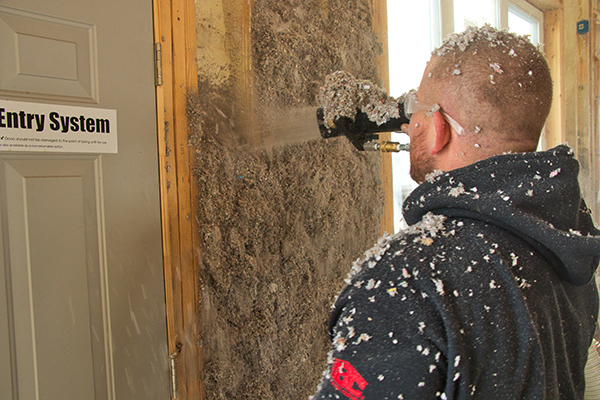 Those who perform wall spray will certainly want to empty their machine of the damp cellulose as it becomes corrosive. Blow excess material into the attic at the end of your job. With our three-way remote, when the hopper empties, you are able to stop the agitator and let the blower continue to push the remaining material out of the airlock and hose. If your hopper is full, then leaving dry material in your machine for a few days will not compromise the life-span of your machine. If you do not use your machine on a daily basis, we strongly recommend that you empty your machine. A couple of 50 gallon garbage bags will provide ample storage for a full hopper. You are able to remove the material easily by loosening the quick connectors and removing the hopper to scoop the remaining material out from between the augers. Every machine has easy to remove dust filters located on the back of the unit. They are 3/4” thick, blue mesh filters that slip into a slot. No tools are necessary to remove or insert them. 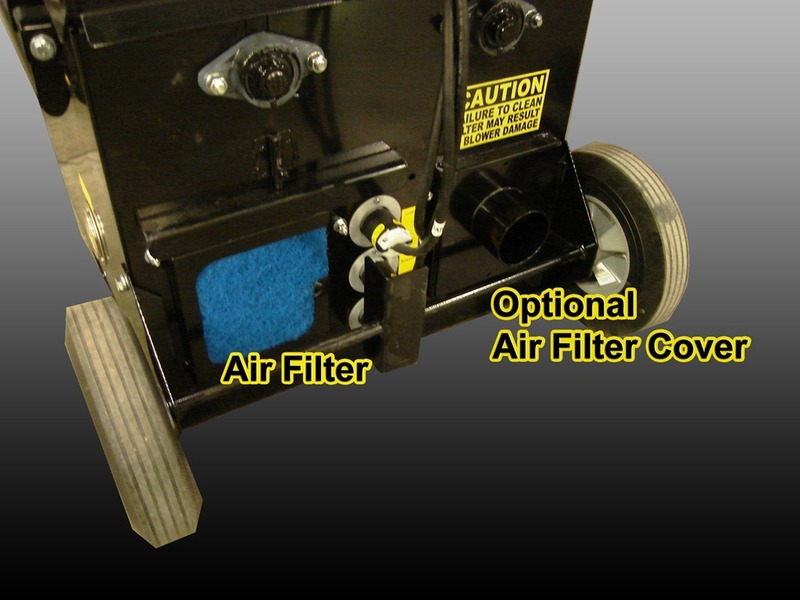 These filters must be cleaned frequently to allow the blower motors to easily bring in air. The filter must be cleaned regularly when on job or when a significant build-up is noticed. Just brush a broom over the filter whenever the opportunity arises. Preferably when machine is shut down so you don’t drive the dust further into the filter from the blower suction. Filters are washable and can be more thoroughly cleaned by rinsing under sink faucet once a month. When using compressed air or water faucet, drive fibers from the inside surface outward. For contractors who permanently keep their CM1500 mounted in a truck or trailer, Cool Machines offers an optional filter cover which lets you connect a 3” hose to go through the floor or wall of your transport. 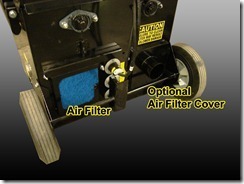 This eliminates the need to clean filters as the machine breathes from outside the dusty environment of a trailer/truck. Foreign debris is a common problem. Some, inferior cellulose products, contain pieces of plastic wrapping and assorted materials. Those loading the hopper, on occasion, will inadvertently drop plastic wrappings into the unit. Inspect the augers to make sure they are free of this debris. Lubricate the bearings every 3 months with Synthetic Multi-Purpose Grease NLGI #2 (GLC). The bearings are easily accessible. Two bearings are external. Three bearings are under the safety cover which is easily removed with two screws. Check the chain tension and keep it very taught. Lubricate every 3 months w/ ‘non-sticky’ lubricant. Note: a regular oil will cause excess fiber to stick and build-up on chains. Some of our customers use a motorcycle chain lube. Cool Machines uses Moly Chain lubricant, Grainger part# 5PE62. Visually inspect the seals. Foreign objects can tear the seals. Tears allow air to escape back into the hopper resulting in diminished p.s.i. for dense packing and loss of production rate (bags per hour) on attics.